Written by Janet Choi on September 15, 2016 .
users who didn’t churn after a month spent 3 minutes and 18 seconds using Groove in their first session, and logged in an average of 4.4 times a day. users who did churn after a month spent only 35 seconds using Groove in their first session, and logged in an average of 0.3 times per day. 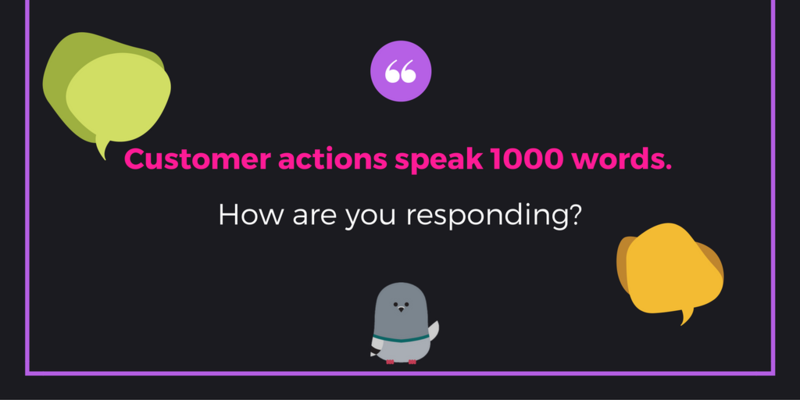 Customer behavior shows reliable signs of intent, almost as if customers were telling them, “Hey, I love your app!” or “Hey, I’m getting stuck.” Customer actions, Groove realized, spoke 1,000 words. How did Groove make a huge difference in their churn rate? Whenever they saw one of these key actions that indicated churn, they reached out with a tailored message. This helped them cut churn by 71%. Why was Groove’s approach so effective? For one, it was responsive — by using behavioral signs of intent to trigger customer communication, it was easier for that message to be relevant, timely, and helpful to the situation. Also, the approach was systematic, as the company applied their data-driven approach to retention. Today we’re going to talk about how to set up your own system of responsive customer communication by showing you 3 ways to automate behavior-based messaging through Customer.io. Behavior: People aren’t finishing that first key action (like integrating, filling out a profile, setting up a project, completing a game) and not coming back. What does it mean for the customer? : I’m not getting value out of your app yet so I’m not motivated to return. Maybe I got stumped somewhere, or I don’t really understand the product. Maybe I got busy with other stuff, or I simply forgot since I’m just starting out and your product hasn’t stuck with me. What you should do: What will help spark a little motivation to engage and get to that aha moment? Help people make progress and get to the next step. That could mean teaching them how to do stuff, helping them remove barriers and obstacles, or inspiring them with specific examples and stories. Okay, you’ve got a strategy for when to reach out, to who, and why. Now let’s set up some automated campaigns that trigger based on specific user activity. Here are 3 types of messaging campaigns that you can set up using Customer.io’s triggered emails and webhook Actions. Nudge people who haven’t completed those key tasks with an email or drip series. 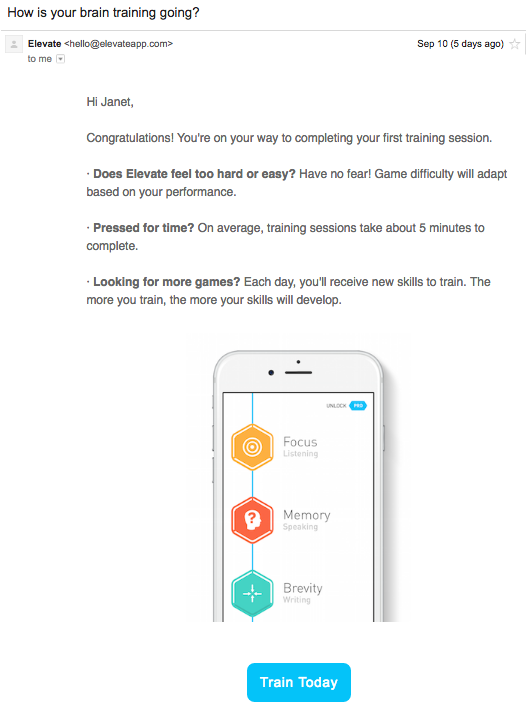 Elevate, a game-based brain-training app, reaches out if you don’t complete your first training session. Instead of nagging you to return, their message starts off on a positive note of congratulations. Then the email proceeds to address different problems users might be having. From feeling too challenged, pressed for time, or wanting more option, there’s a specific clarification for why you should return to the app in the email. At the very least, it’s a succinct nudge to remind folks about the app. The clear, customer-oriented call-to-action “Train Today”(“training” sounds pretty valuable) encourages users to get back into the app and finish that first game. Triggering external communication to customers (like emails or even postcards isn’t the only method at your disposal for helping them make progress and preventing churn. Triggering internal communication is also vital. Internal notifications based on user behavior not only helps your team keep a pulse on what’s happening but also equips them with the information they need to take charge. Sometimes, a situation calls for a more involved conversation or a more manual approach like proactive support efforts or hand-written customer appreciation notes. Trigger a notification into your helpdesk service like Zendeskor Help Scout for your support team to reach out in specific situations. That lets your team know when someone’s first exhibiting signs of churn, for example. Escalate outreach if people have been unresponsive to your triggered outbound messages, customize your requests for feedback, or simply say thanks for sticking around, all based on customer history and context. Let’s take the example of a low NPS rating. You can connect Customer.io to Help Scout, Zendesk, or any other helpdesk with a public API, using Webhook Actions to create new conversations when customers enter a “Low NPS Rating” segment. Even if you’re tracking NPS ratings within Customer.io to make segments for newsletter and automated messages, you may want to reach out to detractors personally to address their specific concerns and reasons for their rating. Getting these workflows into your current helpdesk allows for better record-keeping and opportunities for proactive communication, with ticketing systems that ensure that things don’t fall through the cracks. Team workflows may involve productivity and project-tracking tools like Trello — and it’s often helpful to build a bridge feeding data about what’s happening with customers in your product into that task management flow. Here at Customer.io, for example, our success team keeps a careful eye on the health of our customers to make sure we’re doing all we can to help them be successful. The team uses a Trello board to keep track of proactive outreach tasks. One list on that board is the “New Customer Checklist” and, using webhook Actions, automatically create a Trello card in this list every time an account converts into a paid subscription. Each card contains a checklist to manually go through and verify in the account whether everything is set up for smooth sailing ahead, from making sure the integration is set up correctly to double-checking that the account is complying with our anti-spam policy. We supplement the Trello Action with a triggered internal message into the #team-customer-success channel in our Slack account. Not only does this help keep the success team up to date in realtime, it creates more transparency for the whole company about what’s happening around conversions. Customer.io is a powerful platform that can get complex depending on your knowledge level and your objectives — and our philosophy as a company is that we can only succeed if our customers do. Being able to automate very specific notifications around our customer data to then extend a proactive, human, and very personal approach is vital to that goal. Your probability of making meaningful connections with your customers is much higher with specificity and relevance — a personalized approach that offers support and the real opportunity for dialogue, carried out over time. Then your messages go out to people willing to actually listen. Automating your messaging, external and internal, by responding to actual user behavior is the smartest way to maintain specificity and relevance at scale. Over time, that will help you build much deeper, more trusting relationship between you and your customers.